It’s been gorgeous out in Seattle lately, so it would’ve been tough to stay in this weekend and work on the robot arm. But, for better or worse, I sprained my ankle at pickup yesterday, and had plenty of time to make some good progress. I’ve only found one minor (and fixable) error on the board so far, and the processors come up just fine. I haven’t tried running more than one at a time yet (to see if they program okay and/or share the I2C bus nicely), nor actually running motors in the arm, but I’m close to doing both. I’ll need to enlist Matt’s help soon in figuring out some math & programming, but it’s looking like there might be something ready to show at my birthday – sweet! It’s been nice to be back in Seattle and know I’m here for a couple weeks in a row. There’s a pretty good chance I’ll be heading to China in March, so I’d better get my quality, at-home time in while I can. It was a great weekend to be in town, what with the sixty-degree weather and clear skies. I played a bunch of frisbee yesterday, and spent plenty of time outside today. Unfortunately, I’m sure this is just fake spring (don’t tell the crocuses), but still, it’s nice to have a brief reminder that there’s better weather ahead. I’ve been making slow progress on the robot arm – see updates on that page for more details. I’m pretty sure I won’t have the robot bartender finished by my birthday, but at least the arm will be moving by then. It’s been a fun week in the Bay Area, which included some great meals and visits with lots of folks I hadn’t seen in a while. I honestly can’t remember if I’ve ever done better, but if so, it wasn’t by much. 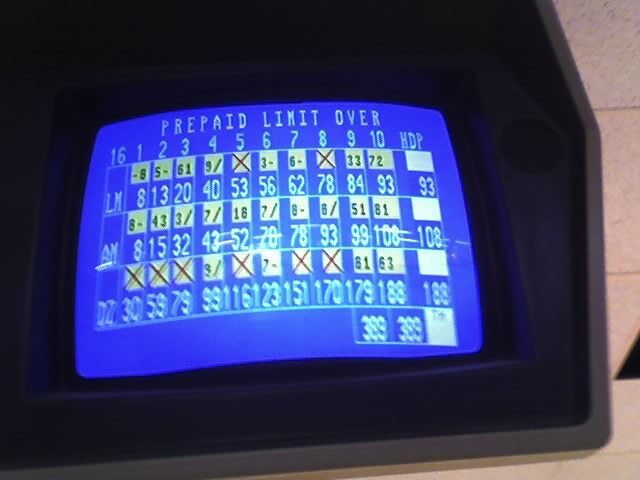 I don’t think I’ve ever broken 200. It was great to see Rif and Anna, along with a bunch of our ex-Boston peeps who live on the West Coast – we all had dinner at Universal Cafe on Tuesday. The food was excellent, if a tiny bit overpriced, and mostly the service was good. I say mostly ’cause they added a 20% gratuity to our bill without asking – rather presumptuous, I’d say. I also got to visit with an old coworker, who took me to the fantastic Ramen House Ryowa in Mountain View. I was skeptical (ramen? I can get that for thirty-five cents at the grocery store! ), but became a convert immediately – it was hearty and very tasty. I went with another friend to one of the newer bars in the Mission – The Monk’s Kettle. I’d say it’s a more upscale, more expensive and less quiet version of Seattle’s Stumbling Monk, one of my favorite Capitol Hill hangouts. All in all, a great trip (plus I learned a lot at my work-related training). In other news, it turns out I won Bunnie’s Name That Ware December 2007 contest! I’ve been excited to play with a Chumby for a while, so it’s a real treat not to have to pay for the privilege. Thanks Bunnie! I went with Jared & Chika to see the puppets last night, and afterward they introduced me to Maekawa, a great izakaya (Japanese bar food) restaurant in the International District. Hooray for more late-night food options. As predicted, the robot arm circuit boards arrived just in time for me to head off to San Francisco and not make any progress this week on the project. From what I can tell so far, 4pcb did a great job on the boards, for about half the price of their next competitor. Plus they included some microwave popcorn in the box! Though I won’t get to work on it much this week, I did put together a list of parts that I don’t have for the board, and I’ll put in a DigiKey order while I’m in California. It’s gonna be a busy month and a half counting down to my birthday (target date for the robot arm’s debut)!